Here are some excellent investment ideas that should provide excellent growth and income over the decades to come. When investing, looking past all of the "noise" is one of the most important things you can do. There are several good options to choose from, but here are three great financial stocks for the next 30 years (and beyond) are Wells Fargo (NYSE:WFC), Goldman Sachs (NYSE:GS), and Prospect Capital (NASDAQ:PSEC). Wells Fargo is quite different from some of the other big U.S. banks. Specifically, they have historically maintained a loan portfolio (along with the rest of their assets) that are of a much higher quality than its peers. This is why they were able to take advantage of the financial crisis by scooping up not-so-fortunate peer Wachovia for a discount. Wells Fargo is the largest bank in the U.S. in terms of market cap, and serves about 70 million customers. They have grown their loan portfolio at around 4% annually over the past few years, and have more than $800 billion in loans outstanding at an average yield of about 4.4%, meaning their interest income from their loans is at least $35 billion per year. 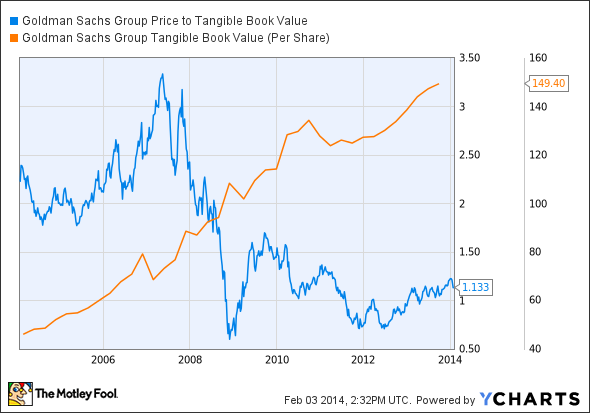 In terms of long-term growth prospects, consider these facts: Wells Fargo has increased its tangible book value per share from $7.95 in 2004 to $21.15 currently, an increase of 166% over a decade, or more than 10% per year on an annualized basis. During this time, the company has grown aggressively, increasing its total assets from around $400 billion to over $1.5 trillion. Wells Fargo's solid asset portfolio and excellent management -- coupled with a dividend that has been raised every year since the crisis -- should keep this growth going for years to come. Like most of the sector, Goldman Sachs has pulled back significantly from its highs, creating an excellent buying opportunity. This is a company Warren Buffett referred to as "a bet on brains" when he invested in Goldman post-crisis, an investment that happened to make him and Berkshire Hathaway a lot of money. Despite performing very well over the past few years, Goldman is still pretty cheap on both a historical basis and in relation to its projected growth over the next few years. Goldman trades for just 10.5 times the consensus estimates for 2014's earnings, which are expected to rise by almost 20% over the next two years. The company has done an excellent job since the crisis in improving as well as growing their assets. Liquidity on the balance sheet has been boosted significantly since 2009, and total assets have grown by 11%. 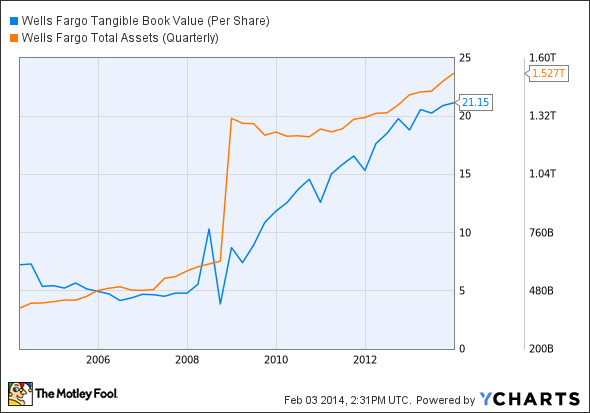 The company's tangible book value has actually grown beyond where it ever was before the crisis, making shares extremely cheap relative to the intrinsic value of the business. As you can see from the chart below, the TBV has risen almost linearly over the past decade, from around $45 in 2004 to almost $150 currently. Prospect and other business development companies (BDCs) make their money by lending to private businesses. The company has a very large and diverse lending portfolio, which means that if one of its loans happens to default, it won't tremendously affect Prospect's bottom line. In fact, as of the most recent quarterly SEC filing, Prospect holds the debt of about 130 different companies. This is not meant to be an exhaustive list by any means, and any prospective investment should be researched to determine if it is a good fit for your particular long-term goals and your current risk tolerance. However, these three companies represent an excellent combination of growth potential (Wells Fargo and Goldman) and income (Prospect and Wells Fargo, to a lesser extent).